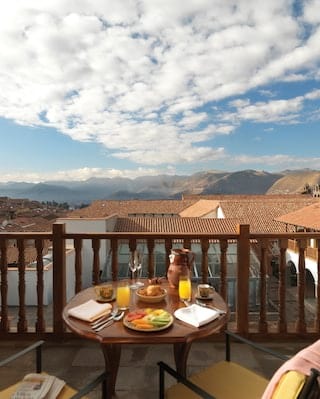 Go all-out on luxury at one of the most stunning hotels in Cusco. Each Signature Suites is unique and brimming with character. All Signature Suites can be enriched with oxygen to help combat altitude sickness. An original colonial arch serves as the centrepiece to this dramatic suite. Gaze across the courtyard and 16th-century fountain from the spacious sitting area. Located in the ancient part of the hotel, this suite is a timeless sanctuary. A large private terrace, living room and office area are ideal for longer stays. This elegant master suite boasts an original, handcrafted ceiling. Soak up a remarkable view of Nazarenas Square from its corner terrace.